My FAVORITE way to use this seasoning is on Tilapia... the most famous of fishes among our #preplife community. During prep, I'll make a 4oz blackened tilapia filet (recipe below) and make HUGE salad with it. My favorite low-cal dressing will be featured in the next AmandaLouise Recipe Tip blog! NOTE: I buy the frozen tilapia fillets from Costco. I like them because they are individually shrink wrapped so they don't get freezer burn. You can easily do this with fresh tilapia, just change the cooking times to 3min each flip instead of 5. If using the frozen filets from Costco, simply run the plastic package of fish under room temp water for to a few seconds to get the plastic wrapping to separate from the fish. Remove from oven, flip fish over, and sprinkle this side with the seasoning. Back in the oven for 5 more minutes. 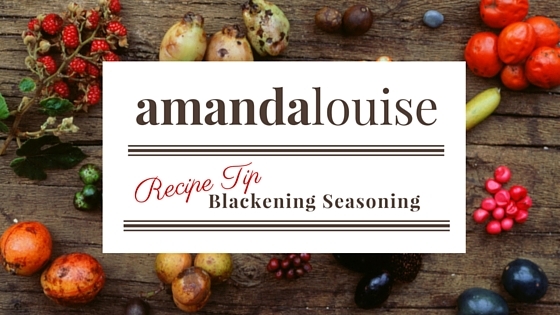 Leave a comment below on how you like the seasoning, and make sure to snap a pic, tag us (@amandalouiseswimwear) and use hashtag #AmandaLouiseRecipes for your chance to be featured on our page! We would LOVE to see you using our Recipe Tips during your next meal prep.